What do you think of when asked to attend the local Chamber of Commerce’s after-hours networking event? I immediately think of that overly energetic, extroverted and annoying person passing out business cards like a blackjack dealer in Vegas. Do you think your goal should be to speak to as many people and collect as many business cards as possible? Are you (unrealistically) expecting to walk away with a new client? All of these are the wrong reasons to attend a networking event and the wrong perceptions as well. You don’t have to be that blackjack dealer to be successful at networking. In fact, meeting just one person and having a meaningful conversation is a win. Change your perception that networking is a necessary evil in your business development plan. Instead, be protective of your time and selective of your networking opportunities: Attend the social events you know you’ll enjoy. If you have only one takeaway from this article, please let it be this: STOP attending networking events that you have no interest in. Quit putting yourself in uncomfortable situations. 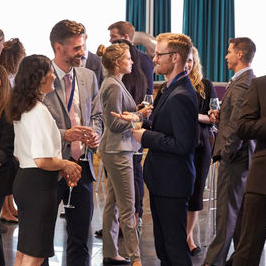 One reason we do not like going to networking events is because we feel the conversations are forced and unnatural. If you do not want to be there in the first place, then your conversations and interest will not be genuine. Instead, choose to attend a networking event because you have a common interest, cause or business need. If you complete an inventory of your hobbies, your goals, your current circles and associations that you’re truly involved in, you’ll find ample networking opportunities. Being there because you want to be will make it a more-productive and pleasant experience. “Expanding your network” will turn into making more friends and establishing more meaningful relationships. Here are just a few recommendations to consider after you decide on the networking opportunities you want to attend. Early bird gets the … — well, you know. Arrive early. This is one instance where being late is not fashionable — it defeats your purpose for attending. If you’re early and the room is not crowded, you’re more likely to see and meet your intended target(s) and have time for a meaningful introduction and conversation. You won’t have to compete with others in the room. Arriving early also allows you time to settle in a bit and get comfortable with your surroundings. The “Buddy System” — think of it as your binkie, your woobie … whatever you want to call it, there is nothing wrong with taking someone along for support and confidence. There are several advantages of taking a co-worker with you: They can help locate your desired target (read more about this in the “purpose and plan” section); they may feel more comfortable striking up a conversation and can bring you into the exchange naturally; you’ll have someone to talk to so you are not standing awkwardly by yourself during the lulls; or they might simply provide a comfort level so you’re not alone. Be careful, however, not to talk only with each other. Position yourselves so that you’re open to others joining your conversation. The “Buddy System Plus” — take a colleague or friend from another company or firm who will benefit from attending the same networking event. Work together to identify targets for each other. Make it a friendly (but not obvious) competition for who introduced the other to the most people. Go with a purpose and a plan — Be purposeful in your selection of networking opportunities — especially when it comes to attending association events. Limit your attendance to those association events that you are truly involved with and have an interest in —and not those of which you are a member on paper or that enhance your bio. Take time to research the event — who attends, how many attend and why they attend. If possible, obtain a list of attendees beforehand to determine who you want to meet (targets). Discuss your targets with your buddy and remember to do a quick review of their LinkedIn profiles before attending. Again, there is nothing wrong with your plan being to meet just one quality contact. Change your end game — While visiting with someone at a networking event, don’t focus on whether they will be your next client or selling them on you. Rather, focus on what they are telling you about themselves (where they work, what they do, what are their challenges). Think of someone in your network whom you can introduce them to. Listen intently (as you should be doing anyway) for clues or statements that trigger what you can do for them: Expand their network, provide a best practice or solve an issue they may be dealing with. Set the stage — to communicate again. Focus more on getting contact information as opposed to giving someone your business card. Promise to follow up via the appropriate avenue (LinkedIn, email, colleague introduction, sample policy). That way, you are in control of pursuit and future communication, and not waiting for them to contact you. The little things — Feel free to enjoy a cocktail because it most likely is cocktail hour, after all, but — of course — do not over-indulge. Make certain to wear clothing appropriate for nametag purposes. Take mints and not gum, and finally, don’t forget to thank the organizers for your invitation. Your elevator speech needn’t be the 30–60 seconds long as is commonly recommended. If you are able to say who you are and what you do in one statement, run with it. Just make certain that your statement is interesting or compelling enough to guarantee a response question. Practice your statement just enough that your delivery is natural, but don’t over rehearse or overthink it. Keep it simple and do not use industry-specific terms, acronyms, jargon or overly technical language. As with any business development activity, choose your surroundings and your audience as much as possible. Being where you want to be will increase your success while you’re enjoying the experience. For help with business development strategies or training in effective networking, email me, Glennie Green, at ggreen@jaffepr.com.